This workshop is designed for those who have completed a lithography course either with Impress or a recognised institution (ie, QCA) and would like to continue with their own projects under the supervision of experienced tutors. Participants are invited to bring along past or current lithography projects (on plates only, please) that they would like assistance with producing. Chris and Claudia will be there to assist with all stages of the processing and printing process, and to help you refine your lithography skills. Want to properly wrap your head around the etching process, or feel you need more experience operating the rollers and presses? This is the workshop for you! Students bring along their own projects. Claudia Husband is a Brisbane-based artist and printer, working with lithography and intaglio printmaking. She currently holds a degree in Fine Art from the Queensland College of Art, and has recently returned from training at the Tamarind Institute in the United States. 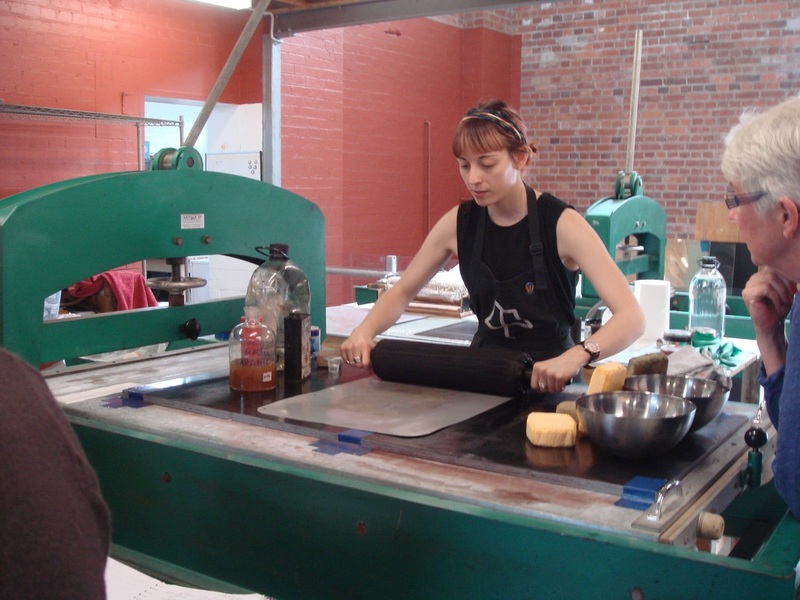 Claudia tutors in lithography at the Queensland College of Art printmaking department, and works as an edition printer in Brisbane.